Powering your real estate website with IDX is ideal for promoting your business, but adding the right social media strategy can really separate you from the pack. Facebook, Google+, Twitter, LinkedIn and Pinterest are leading the way as the most popular social networks and you can create a free account with all of them. The trick to getting the most out of your social media efforts is understanding how these tools differ from each other. The list below breaks them all down, including tips on how REALTORS can best leverage each tool to boost traffic and engagement with their IDX and real estate site – whether you’re new to the game or an experienced social media user. You probably know, Facebook is the largest social network of all with more than one billion monthly active users. With an audience this large, Facebook is a no-brainer for real estate agents looking to promote their business. And it’s not just for teenagers; about 2 out of 3 Facebook users are age 35 or older. From a gender perspective, females compose 60% of users with males accounting for the remaining 40%. 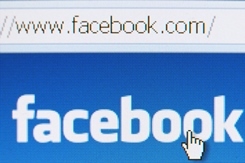 Get started by creating a Facebook business page. Keep in mind that a business page is different from a personal account on Facebook, as you’ll read later in this article. Agents can leverage a variety of Facebook real estate apps for marketing purposes, such as advertising their listings or linking to IDX search result pages that highlight a popular area of town with a high density of homes on the market. You can do even better by stepping up your creativity a notch. Advertise homes on Facebook real estate related pages by using pre-filtered results of IDX data that showcase your best properties, giving potential buyers just the information they’re seeking. Establishing a Google+ Business page is another great way to expand your business’ reach. Today, there are more than 500 million people with a Google+ account. 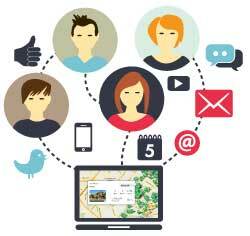 2012 demographics show more than 40% of users are single and 2 in 3 account holders are male. The process of creating a Google business page is similar to that of Facebook. Although the Google+ audience is about half the size of the Facebook crowd, sharing links on Google+ holds a distinct advantage over other networks. Links shared on Google+ are rapidly indexed and quicker to appear in search engine ranking pages than links from outside of Google. That means when you (or anyone else) shares content from your Google+ business page, it helps your real estate business bubble to the top of relevant search results. Because all pages generated by our IDX plugin are fully indexable, using Google+ to share links to new IDX listings on your site is a great way to encourage Google to crawl and index your domain for the newest MLS listings. Microblogging 140 characters at a time is the name of the game at Twitter and creating a new account is a cinch. A Pew report from last year found approximately 15 percent of adults on the Internet use Twitter with the 18-29 demographic composing 26 percent of the Twittersphere. Minorities have a strong presence on Twitter — 28 percent of online black adults and 14 percent of online Hispanic adults are active users. In urban settings, 19 percent of adults using the Internet are active on Twitter, compared to 14 percent of suburbanites and 8 percent of people in rural areas. You can attract buyers to attend your open houses using the #openhouse hashtag in your tweets. People searching for open houses on Twitter will find results like the example below. …where each of those links loads individual homes, filtered search results or other custom search pages generated with your IDX. Implore others to follow you by serving up links to great content about home ownership and maintenance. 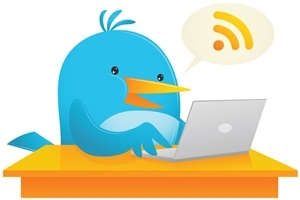 You can even use services like Twitterfeed.com or HootSuite.com to automatically generate a tweet every time you publish a post to your blog. Creating a LinkedIn account is a must for every agent. It’s just as important as using these other tools, but the focus is different. If you don’t have an account, register and join more than 150 million working professionals who are already on LinkedIn. Unlike a Facebook or Google+ business page where you’re likely promoting houses for sale and services you provide, LinkedIn is a professional network intended for selling yourself. Take the time to include information in your LinkedIn profile that isn’t appropriate for other social media tools like past real estate successes, specialties or any awards you’ve won. Make sure to include your picture in your profile to put a face with your name. Expand your network by connecting with other professionals to share information and opportunities. 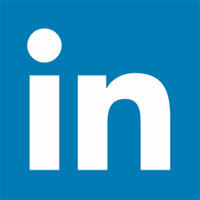 Consider joining or starting a LinkedIn group to network with other real estate professionals. Stay up to date on industry trends and events by following thought leaders in the real estate industry. Keep in mind that while you can post links to listings on your LinkedIn account, it’s best used to establish your credentials and generate leads rather than shop properties. There’s no doubt that Pinterest is the new kid on the social media block and people are taking notice. Similar to Twitter, about 15 percent of online adults use Pinterest. 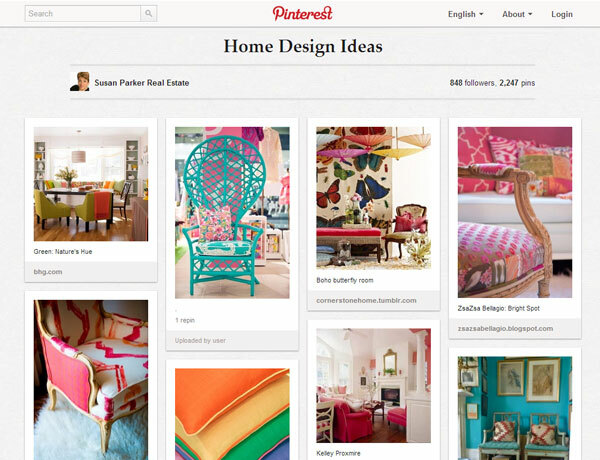 Unique visitors on Pinterest skyrocketed 2,702.2 percent since May 2011. Unlike other social media tools, Pinterest has a dominant gender gap with females composing 80% of users. Also, half of Pinterest users are parents. Perhaps the most compelling demographic about Pinterest is that more than 28 percent of users have an annual income greater than $100,000. Getting creative on Pinterest is easy. Pin images of the cities, developments or communities you serve to give people a feel for what it’s like to live in these areas. You can also pin a series of photos from a single home or apartment to showcase its features prior to an open house. Another suitable option is to post photos demonstrating home decor tips for people who are getting ready to sell. Keep in mind that on Pinterest, 80 percent of pins are actually “repins” – meaning a user grabbed a photo from an existing board and added it to their own. By offering great ideas, you can attach the name of your realty business to pins that others find valuable. When the option exists, as it does with Facebook and Google+, it’s best to create a business page instead of a personal profile to promote your business. Simply put, this ensures your private and work lives are kept separate. Promoting your realty business with a profile pic of you in a Halloween costume doesn’t evoke the professional image you need to stay competitive. The same notion applies to other social networks. Create separate personal and business accounts to maintain your reputation as a credible real estate expert. Use this information to determine which social media tools will work the best for your real estate business. Start with demographic data and consider the backgrounds of your typical clientele. When you’re ready, sign up for the social media accounts you’ve targeted and start populating them with the type of homes, decorating, neighborhood or other content that’s best-suited for each platform.